As thrilling as it was to see all of Broken Social Scene's members take the stage, sometimes all at once, the Toronto band's homecoming show was cheapened somewhat by the avuncular antics of bandleader Kevin Drew, who announced guitar solos before they happened and drew attention to certain members as they hopped onstage by saying "Ooohhh look who it is!!!!" In spite of Drew's overcompensating, the night felt like a victory lap. 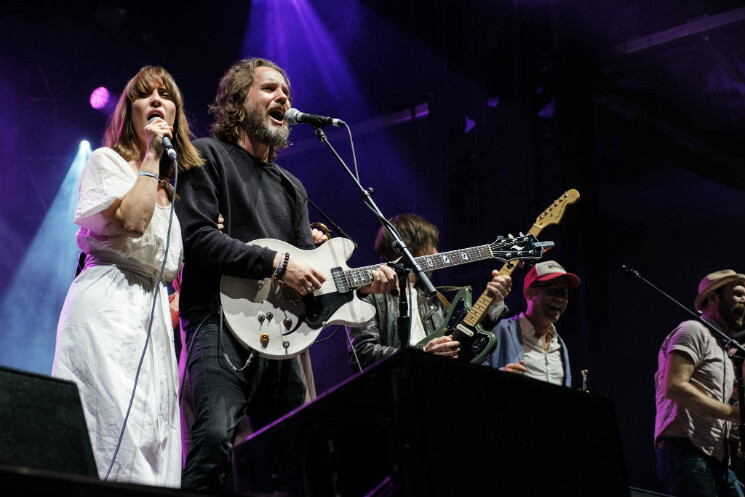 Though they played new songs "Halfway Home" and the Feist-led "Hug of Thunder," which are slated to appear this July on their first record in seven years, Saturday night's set felt more about past glories. Beginning with a lean (lean for them) six members onstage, the band ballooned to 16 to play a celebratory "7/4 (Shoreline)," and suddenly the cold wind coming from the west didn't matter. And no corny commentary could derail the steady bass line from "Stars and Sons" or the palpable fun Feist, Emily Haines and Amy Millan were having singing along to "Almost Crimes." During these moments it was surreal to think that the festival wouldn't exist had it not been for the band's successes, making the many triumphant moments onstage feel both right and entirely deserved. Pre-order Hug of Thunder on clear vinyl here, or pick up Broken Social Scene's breakthrough album You Forgot It In People here.